Entries with tag sticky note . The North American freight rail industry depends on rules and processes to ensure the proper movement, interchanging, monitoring and repair of more than 1.5 million railcars across the 144,000-mile North American rail network. Why are these rules so important? "They externalize business logic, enable business agility and enforce data quality around activities that are critical to safe and efficient rail operations," said Jerry Vaughn, Railinc's director of interline product management. Freight rail operations are complex. Rail carriers haul and interchange cars that do not belong to them. A railcar owned by a company on the East Coast might get pulled from service for repairs on the West Coast. Railcars and individual components need regular testing and inspection, no matter where they are. Data on activities such as repairs and recalls have to be reported and shared across the industry to verify the health of railcars in service. Industry rules help to ensure the entire industry applies the same standards to these types of tasks. Contained within the Association of American Railroads' official rules manuals, industry rules cover everything from component characteristics to data reporting procedures to processes around car hire. Many of Railinc's systems and applications are designed to support these rules-based activities and are embedded in critical operations and financial systems throughout the industry. A centralized system for tracking damaged and defective railcars, DDCT standardizes the process for reporting and storing data on these cars. For decades, this information was documented on a 3 1/2-inch by 8-inch paper defect card affixed to the side of a railcar. Companies maintained their own tracking systems, which often led to conflicting or unavailable data and required car owners to contact carriers to find out a car's condition. A defect card holder on the side of a railcar. Implemented in January 2011, DDCT standardized these processes, improving data accuracy and timeliness, reducing administrative costs for railroads and car owners, and improving the enforcement of industry car hire rules. Industry rules require that rail carriers, car owners and repair shops use DDCT for all cars that participate in interchange. Railinc team members at the whiteboard. Rule 107, referenced in the sticky note, establishes the sequence of events that must occur to compensate a railcar owner whose equipment is damaged or destroyed. For example, if a railcar is damaged during interchange, the responsible rail carrier must follow steps detailed in Rule 107 to reimburse the car owner for the damage or to pay for the repair. DDCT sends auto-generated email notifications to car owners throughout this process, helping them stay informed about the status of their cars. "Based on what we were hearing from our customers, one of our emails needed more information," said Sophie Hamida, a business analyst on the DDCT team. "Car owners were taking time to call Railinc to find out why the system was displaying the data it was." In this case, the repairs on a railcar might be complete, but the incident did not show in the system as being closed and the car itself was not removed from the related maintenance advisory. The DDCT team added verbiage to the email that detailed the timeline for closing the Rule 107 incident. "The aim was to reduce customer confusion about why a car that might have returned to service still showed up in the DDCT system as an open incident," Hamida said. "We only added two sentences to the email, but it will help make what can be a challenging process a little easier for customers." The business logic, rules and processes embedded in Railinc products help to enable the enforcement of industry requirements, like Rule 107. Last year, the company launched a multi-year Rules and Process Modernization (RPM) program, which will modernize the management of the industry rules and processes that underlie our applications and systems. The RPM program leverages technology to enable the company to take a more consultative approach with customers and helps to improve the efficiency, consistency and reliability of these rules and processes within Railinc applications. DDCT was among the program's proof of technology projects. "Nearly half of our project development activities involve the implementation of business rules and processes," said Jeanine Bradley, senior manager for business rules and process management. These rules and processes have traditionally been buried in code in Railinc applications. Because they were not visible and documented with a common language, it has been challenging to respond quickly to customer questions or requests for changes to applications. "The RPM program is an effort to advance how we manage rules and processes within our applications," Bradley said. "We want to be able to eliminate the complexity so we can support our customers better and deliver innovative solutions that meet the ever-changing needs of the industry." The sticky notes you find around Railinc tell stories about our culture and how we develop our products, how we learn from and work with our customers, and how we meet the technology needs of the freight rail industry. A regular feature on the Railinc Tracks blog, Found on a Sticky Note takes a look at an individual sticky note and provides insights into who we are and what we do. Not all the sticky notes around our office have to do with the Agile software development method. Sometimes you just need a reminder to pick up snacks for your child's class. Our employees love that Railinc supports work/life balance. Need to step out of the office to pick up those pretzels or run a few other errands? Is it your day to hit the gym for an afternoon workout? Or are you helping out in your child's classroom and need to be out of the office one morning? It isn't a problem. Our benefits include flexible scheduling and telecommuting options that give employees the freedom they need to get their Railinc work done without sacrificing their personal lives. For example, an employee with a long commute could work from home a few days a week to cut down on the time they spend on the road. And we provide the technology and flexibility to work from home at a moment's notice if a child's illness, a personal matter or a snow day prevents an employee from coming to the office. "The flexibility is one reason I've been here for 17 years," said Megan Rowe, a buyer for the company and the owner of the pretzel sticky note. The flexible scheduling—she works through lunch so she can leave a little early each day—helps her better manage her two daughters' schedules. For a long-term arrangement like an alternative work schedule or regular telecommuting, our full-time employees just need to work with their immediate manager to agree on terms. Because of the nature of specific jobs, some positions aren't eligible for telecommuting. Leigh Baudreau, senior manager for financial planning and analysis, works from home one day a week. "It gives me concentrated work time," she said. "I'm always available on email and IM chat, but I can get quiet working time at home." Everyone on Leigh's team can work from home twice a week, but the entire team is in the office together one day a week. It takes flexibility on the manager's part, Leigh said, and there are hectic times of the year. But the telecommuting option is a great benefit that her team appreciates, she said. "I can work from home if I need to, take a break during the day for a pediatrician visit with my son or even just run a personal errand," said Chris Richter, communications manager. "I have two small children, and knowing that I have that flexibility gives me peace of mind when it comes to managing our schedules." At Railinc, work/life balance isn't just about about figuring where and when to work. We also support family time in the office. When school's out, it isn't unusual see children in the office, reading books or playing with toy trains while mom or dad works. On Halloween, you're likely to run into Batman or a princess or a cowboy walking around with buckets full of candy. Each year the children of employees visit the office for trick or treating, and employees decorate their work spaces and provide treats for the kids. And later this month, employees will bring their children to visit Railinc for Take Your Daughters and Sons to Work Day. What better way for a kid to start their day than talking trains with mom or dad? Take a walk around Railinc any morning and you'll see product teams meeting at glassboards plastered with multicolored sticky notes. These notes are a key element of the Agile software development methodology and provide a low-tech way to track the high-tech work that happens at Railinc. Look deeper and the notes will tell the story of how we develop our products, how we learn from and work with our customers, and how we meet the technology needs of the freight rail industry. Here on our blog, we will pull out a snippet of that story in the form of a single sticky note. We'll tell you what's behind the words that are on it and give you a little insight into the work our people do every day to serve the freight rail industry. Here at Railinc, these notes include information on everything from user stories and quality assurance checks to tasks in progress and tasks completed. Even though Agile is a cornerstone of Railinc's culture, the ways our teams use sticky notes are unique to each product group. 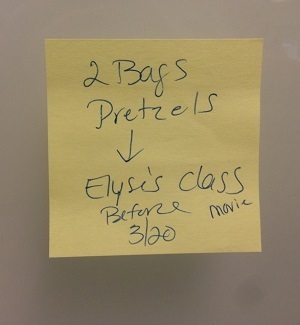 Some use sticky notes to capture their tasks. Others focus on user stories. One team incorporates index card-sized printouts from a third-party Agile software that Railinc uses to track the progress of product development. "The value the sticky notes is in the visibility," says Jose Solera, Railinc's director of enterprise services and our resident Agile evangelist. "With the notes, teams can see where they are in a project. They are easy to write and move around as things change. They're also a good way to prompt conversations about what's been done and what needs to get done."